Photographs in and around Boston Common, Boston, Massachusetts. 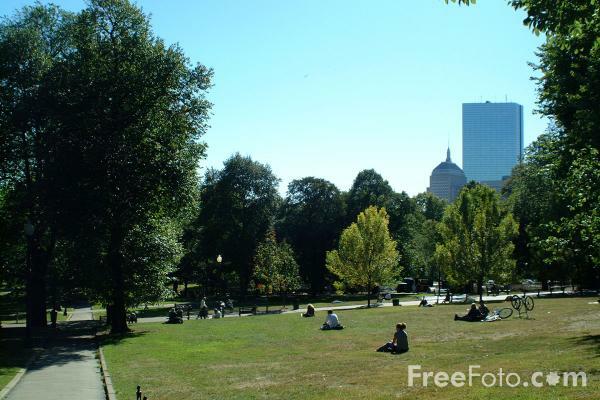 The Boston Common is 50 acres of open land and is the oldest public park in America. Full of activity, the Common offers some of the citys best people-watching. The State House, located on Beacon Street, was designed by Charles Bulfinch and was completed on January 11, 1798. Now it is the seat of the Massachusetts state government and is the oldest building on Beacon Hill. Park Street Church, with its 217-foot steeple, is located at the corner of Park and Tremont Streets. Built in 1809, Henry James called the church the most impressive mass of brick and mortar in America. VIEW: More images from the category Boston Common, Boston, Massachusetts or around the same time .